September 11, 2017 – For the first time astronomers have measured how a galaxy’s spin affects its shape. It sounds simple, but measuring a galaxy’s true 3D shape is a tricky problem that astronomers first tried to solve 90 years ago. “This is the first time we’ve been able to reliably measure how a galaxy’s shape depends on any of its other properties – in this case, its rotation speed,” said research team leader Dr. Caroline Foster of the University of Sydney, who completed this research while working at the Australian Astronomical Observatory. The study is published today in the journal Monthly Notices of the Royal Astronomical Society. Galaxies can be shaped like a pancake, a sea urchin or a football, or anything in between. Faster-spinning galaxies are flatter than their slower-spinning siblings, the team found. “And among spiral galaxies, which have disks of stars, the faster-spinning ones have more circular disks,” said team member Professor Scott Croom of the University of Sydney. The team made its findings with SAMI (the Sydney-AAO Multi-object Integral field unit), an instrument jointly developed by The University of Sydney and the Australian Astronomical Observatory with funding from CAASTRO, the ARC Centre of Excellence for All-sky Astrophysics. SAMI gives detailed information about the movement of gas and stars inside galaxies. It can examine 13 galaxies at a time and so collect data on huge numbers of them. 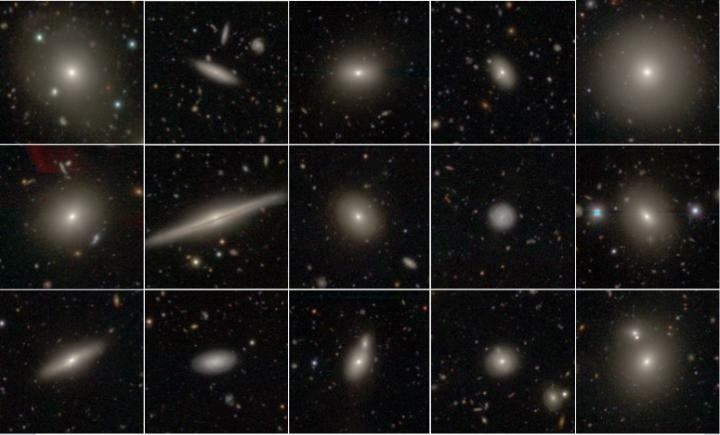 Dr. Foster’s team used a sample of 845 galaxies, over three times more than the biggest previous study. This large number was the key to solving the shape problem. Because a galaxy’s shape is the result of past events such as merging with other galaxies, knowing its shape also tells us about the galaxy’s history.